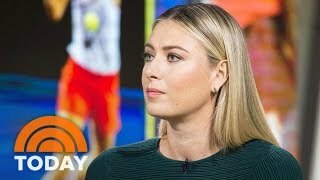 Yes, Maria Sharapova is one of the greatest to ever play the game of tennis. Yes, she is beautiful, poised and articulate. Yes, her marketability among female athletes is unrivaled. Yes, she was embroiled in a controversy that resulted in suspension. Yet, despite all of this, the real Maria Sharapova is widely unknown. Told in her own words, with a raw intimacy never before revealed, 'Maria Sharapova: The Point' spans the most pivotal year in Maria Sharapova’s life. The film begins with the moment Maria received notice of her suspension from tennis, and takes us through her triumphs and struggles as she works to prove her innocence, and ultimately, prepares for her comeback. As we follow Maria on her journey, we see her evolve. In the process of fighting for her truth, she has been emancipated and found a new perspective that’s breaking down the wall she’s long lived behind. Through every moment, we see the depth of Maria’s humanity, and the lessons learned from a career that began at age 14. We better understand her strengths, vulnerabilities and the ways in which they shape her. In the end, relying not on the media, but on Maria's own unfiltered words, her fans – and the entire world - will know her like never before.